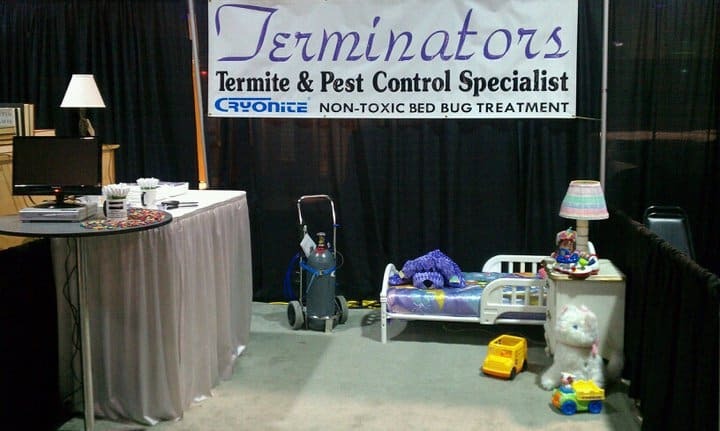 Terminators is proud to offer Cryonite; The newest, most effective non-toxic treatment for bed bugs and other pests. Cryonite is an innovative, non-toxic patented technology used for the elimination of crawling insects in all stages of life. It has been used extensively in Europe, Australia and the United States with proven results. The Cryonite system releases CO2 as “snow” which, when applied to the infested sites, rapidly kills bed bugs, cockroaches and flour beetles on contact. Cryonite is not a consumer product and is sold exclusively to professional pest control companies, hotels, universities, health care facilities, long term care facilities, assisted living and shelters and property management companies. The Cryonite system eliminates insects without leaving a residue or requiring post treatment work. This will minimize down time for hotels, food industry, schools & hospitals. Cryonite can be used directly on mattresses, electronic equipment & food production. If you're unsure as to whether or not you have bed bugs, bed bug traps can be a good option as a preliminary step. Use our Bed Bug Preparation Checklist so you’ll be ready for your appointment. Save $100 Instantly With Your First Cryonite Bed Bug Treatment! Cryonite kills insects by freezing. The freezing process is rapid and reaches a very low temperature. The speed is essential for effectiveness. The cooling medium is carbon dioxide snow, which the Cryonite unit sprays from the specially designed and patented nozzle. Frozen carbon dioxide is also referred to as “dry ice”, as it sublimates, is converts from ice/snow directly to gas with no liquid phase in between. This enables treatment in areas such as electrical sockets, motors, pipes, cabinets and more. For example, when used in the food processing facility, flour will not turn into gooey dough! Through an optimal combination of snow particle size and speed, the cooling is quick enough to ensure that bugs, including eggs and larvae, will not survive. The Cryonite unit is ergonomic in design, with a telescope function for extended reach and easy working posture and a “goose-neck” which can be angled up to 90 degrees or more for optimal spraying angle and deeper reach. The Cryonite snow penetrates easily into deep cracks and crevices, complicated machines, and reaches far into long pipes.